We're hiring at All Saints Church in Pasadena! 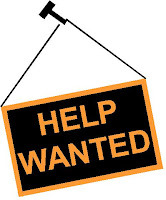 Links to the job descriptions are posted below. Please take a look and see whether you or someone you know might find the place where your deep gladness meets the world's deep need! The Rev. 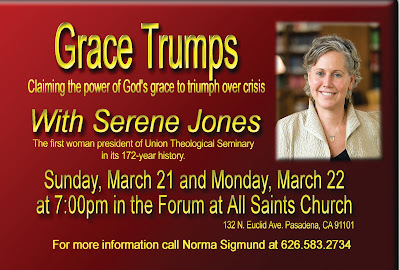 Dr. Serene Jones is the President of Union Theological Seminary and an ordained minister in both the Christian Church (Disciples of Christ) and the United Church of Christ. Previously on the faculty at Yale University, she has authored or edited seven books and numerous articles and has been featured in the national media, including Oprah's Soul Series with Ed Bacon. Please do not miss being transformed by the soulful intellectual firepower of this amazing 21st century religious leader. Your life will be empowered by her story. Child care is available for children from infancy through fifth grade by calling 626.583.2781 at least 24 hours in advance. No reservations are needed for Sunday mornings. I want to speak and participate in this day when many across the nation are focused on prayer and I want to say a few words about the true nature of prayer and the true nature of God. And certainly I would not want to be silent on this day ... for as Dr. King often said, there are times when silence is betrayal – and today is certainly one of those days. It is important to understand that prayer is not exclusively a Christian act. Prayer is an act of faith in which all people of all religions participate. There is one God. There is no such thing as a “Christian God.” Because God is not exclusive. Prayer certainly can be offered in the name and spirit of Christ and there are prayers that are in the Christian tradition. Now, “the Family” is a secret organization that does not hold with what I’ve just said about God and about prayer. Watch the video of Ed's sermon here. The American Prayer Hour is a nationwide affirmation of inclusive values and a celebration of diversity that is the bedrock of our nation. 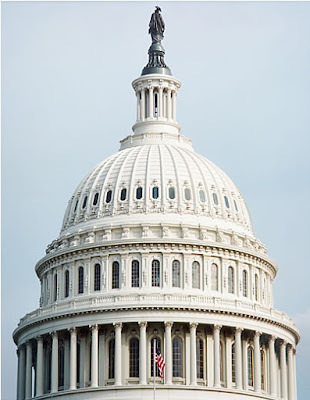 It is also a protest of The National Prayer Breakfast, which is hosted by The Family — the secretive fundamentalist organization directly tied to the draconian “Kill the Gays” bill in Uganda. All Saints Church is proud today to stand and pray in solidarity with those across the nation who are witnessing to God’s inclusive love as they pray for a world of peace, justice and compassion. The world may watch pops stars at the Grammys from Staples Center Sunday, but there is plenty to be proud about in the world of jazz and classical music. A famed jazz pianist that has local roots was presented a Grammy for his arrangement in an album that was a tribute to pianist Oscar Peterson. Bill Cunliffe was awarded the 2009 Grammy in the Best Instrumental Arrangement category for his track “West Side Story Medley” in the album “Resonance Big Band Plays Tribute to Oscar Peterson”. Cunliffe is active locally. In addition to his performances at the Theater@Boston Court, he is the Composer-in-Residence at All Saints Episcopal Church in Pasadena. This is not Cunliffe’s first award for his efforts, but probably the best known. He has picked up many awards for his piano jazz efforts. Cunliffe also regularly performs with the Hamilton-Clayton Jazz group that were named Grammy winners in 2007 for their Telarc recording and often are featured at the Hollywood Bowl. Hamilton is a resident of South Pasadena, Clayton lives in Altadena. Other past local Grammy winners include the Southwest Chamber Music that took home Grammys two years in a row in the Chamber Music category. This year, the Best Classical Album was awarded to the San Francisco Symphony, Michael Tilson Thomas, conductor, for its recording of Mahler’s Symphony No. 8. The Best Chamber Music Performance Grammy was awarded to the Emerson String Quartet for its album “Intimate Letters”. The Emerson String Quartet is a regular favorite at the Coleman Chamber Concerts, one of Pasadena’s oldest classical music organizations. Cunliffe fans should also note that this Sunday -- February 7th -- a Cunliffe arrangement of Psalm 106 will debut at the 9:00 & 11:15 services ... written in honor of Lydia Wilkins' 106th birthday!